The CityLifeStylist: The Contest's Over, but Zinio's Promos are Still On! 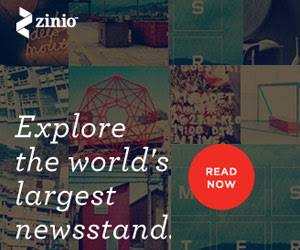 The Contest's Over, but Zinio's Promos are Still On! Congratulations to the nine winners of Zinio digital magazine subscriptions! You will each receive an email notification including instructions on how to claim your prize. The contest may be over but you'll still feel like a winner with Zinio's current offerings, with a number of magazine titles at up to 50% off! You've only got until March 19 to avail of the promo so click the banner now to choose your titles and place your orders! You can also browse through some of its featured magazines for free and access thousands of articles that you can also share with friends. Use Zinio on your desktop computer, laptop, tablet, Android mobile phone, iPhone, iPad, and even on your Kindle Fire. Recognized as the Best iOS Magazine App during the the Best Ever Apps Awards at the 2013 Mobile World Congress, Zinio offers thousands of the world's top magazines in digital form. It has delivered over 70 million issues worldwide in 2012, truly making it "the world's largest newsstand." *Thanks to Zinio for sponsoring this post.